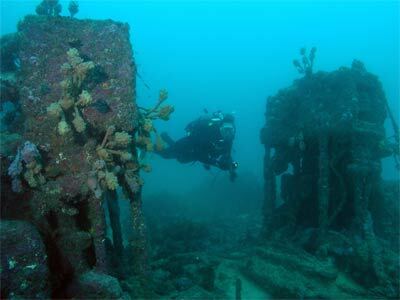 "The SS Tuggerah is Sydney's best wreck dive"
Although the TSS Wandra is an extremely small wreck, it is one of the most enjoyable wreck dives in NSW. The Wandra was a wooden coastal cargo ship constructed by D. Sullivan at Coopernook in the Taree area of NSW in 1907. The new ship was owned by Allen Taylor and Company, which started business in 1893 carrying timber from the North Coast to Sydney (the company was still operating in June 1984, but not with ships). The Wandra was 36 metres long, with a beam of just over 8 metres and displaced 164 tons. The small vessel had twin compound engines which were powered from a single boiler. On 15 December 1915 at 2pm, the TSS Wandra left Moruya Heads with a cargo of timber for Sydney. She passed the Point Perpendicular Lighthouse (at the entrance to Jervis Bay) at 9.20pm with a moderate south-easterly winds and sea. One mile off Crocodile Head (a few kilometres to the north of the light), a wave came over the bow and then another. The hull's timbers came apart under the pressure of the waves and water flowed in and she listed to port (why do most ships in NSW list to port before sinking?). The ship's pumps were started but made no difference. The Wandra was out of real control but Captain Reubin Lucey managed to steer her further along the coast and into the relative safety of The Drum and Drumsticks where the anchor was dropped. The crew lowered on of the lifeboats and climbed aboard. As Captain Lucey entered the lifeboat, the Wandra sank. The 12 survivors (everyone on board) rowed to shore (probably a small protected inlet to the west-north-west) and then walked to Point Perpendicular where they arrived at 1.30am. The wreck of the TSS Wandra was discovered by John Harrington and Paul Jones in 1973 while searching for aquarium fish near the Drums and Drumstick. The wreck of the Wandra does not cover a large area, but it makes up for it in quality. 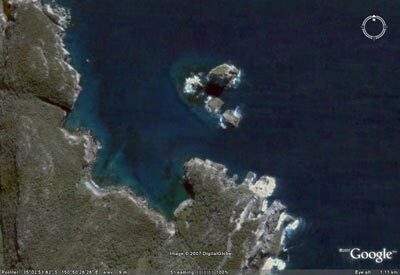 The remains lie at 26 metres on a sand bottom straight next to the rocky reef at GPS Reading of 35° 02' 47.8"S 150° 50' 16.8"E (using datum AUS66 - see my GPS Page for more details). Run in on the mark above right till the reef appears. Anchor on the reef, you will only be a few metres from the wreck. See GPS and Marks Page for more details. A description of the wreck is as follows. From the south there is a small winch and to the east about five metres away is a bollard and another unknown item. These have kelp growing on the top. Some anchor chain can sometimes be seen above the sand but this can change as the sand moves about a fair bit. There are some ribs of the hull or similar sticking out of the sand near here as well. About 10 metres north there is a large winch and 15 metres further north again there is the boiler, right up against the reef. This is quite large and worth examining. It has many things living in the pipes, including moasic eels and conger eels. You will probably be anchored near the boiler, so this is most likely where you start and end the dive. Right next to the boiler are the engines. 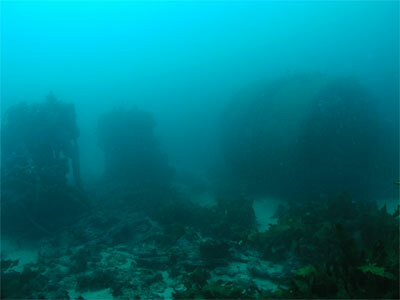 These twin cylinder engines sit upright, with the smaller cylinder facing the bow (south). They are tiny compared to most shipwreck engines you will ever see. I even think that they look "cute". 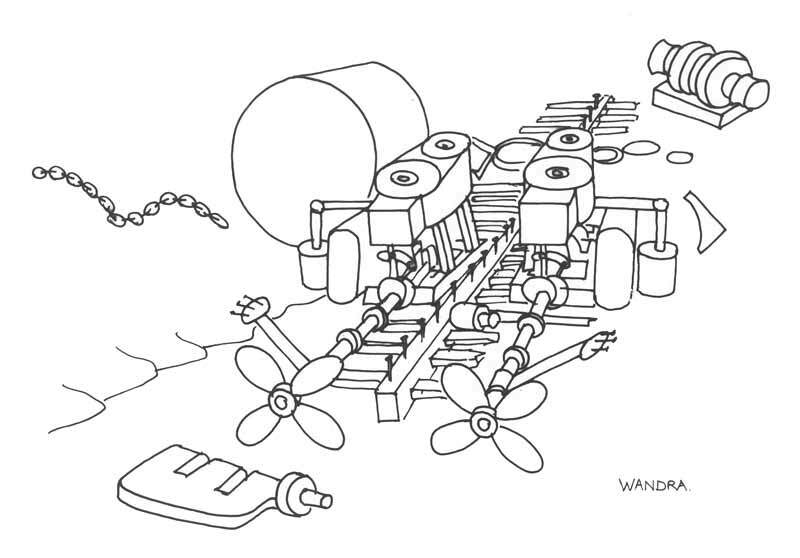 A prop shaft runs from each engine to the north, with small propellers at the ends. These are mostly clear of the sand, but again, can sometimes be buried. In front of the props are a small winch as well as a circular loop thing (I have no idea what this might be). In between the prop shafts there are lots of things to see, including some timber pieces that were probably part of the hull and decking. You can also see the bolts that held her together. After big seas, you can see some of the timber cargo lying on the sand. 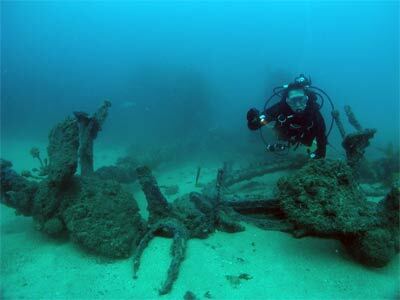 The ship's telegraph was found by a local Jervis Bay diver and is now in his lounge room. It was buried under the sand. The remaining cargo is rotting away, victim of time and marine animals. An excellent dive, usually with calm seas and good visibility.